As an artist, stepping up your art business is probably at the top of your list. This is the year you will get organized, meet new clients, and sell more art. And, what better way to start than improving your social media skills? Whether you’re wondering what, how, or when to post, check out this social media strategy artists should use in 2017. Have you heard of the 80/20 rule? While sites like Facebook and Twitter are great for marketing your art business, social media is meant to be exactly that—social. People who follow you want to be wowed, not sold to. Therefore, when considering what to post in 2017, stick to the 80/20 rule: 80 percent entertaining, 20 percent promotional. And, that’s the great part about content marketing! The fun and engaging content you post can actually help sell your art by creating goodwill towards your business. And, it opens the door to about a million ways to keep your fans engaged. Everything you post in 2017 should sweep your audience off their feet and into your world of art. And, posts that include images or videos are becoming the best way to catch attention on a newsfeed that is so easy to scroll through. Try creating a time-lapse video during the creation of your piece or make a video blog about your latest residency. Post a work-in-progress picture asking followers to stay tuned or give them a behind-the-scenes look inside your studio. Or, make posts as interactive as possible. Ask your audience questions like suggestions on what to name a piece. Each social media channel is different, not only in the way you post but what type of audience may be following you. Instead of posting the exact same thing to all your channels, try to mix it up. If you post one work-in-progress picture to Instagram, add an entire photo album on Facebook of your process from start to finish. It may take more work, but it will be more enticing for fans to follow you on multiple social media accounts. Isn’t it better to do a few things really well than a bunch of things not so well? This is especially true when it comes to social media. In the end, trying to take on every social media channel in sight just leaves you with no time and neglected accounts (which does not bode well for your brand). So for your social strategy in 2017, work on finding the right social media channels for you. Then, concentrate on making a few quality posts for each of them. Why make posting harder than it has to be? Take advantage of the free insights feature that comes with most social media business accounts, and see what kind of content your fans respond to the most and when the best time to post is. Then, make more posts like that! Because a well-informed social strategy is the best social strategy. And, we aren’t talking about your art. Make your 2017 social media strategy more effective by blocking out a chunk of time devoted just to creating your social media posts. Natasha Wescoat of The Artist Mastermind Podcast explains how in her art marketing podcast episode. Thank heavens for sites like Facebook and Buffer that help artists save time on social media. Once you’ve created all of your upcoming posts for your marketing calendar and used your business page insights to see when your fans are online, block out another chunk of time to schedule your content. These sites will post your content automatically on the day and time of your choosing, so you can spend more time in the studio. Never forget to post by staying organized with Artwork Archive’s Schedule and Reminders feature. While these scheduling sites are miracle workers, they still can’t replace the ever important aspect of being social. 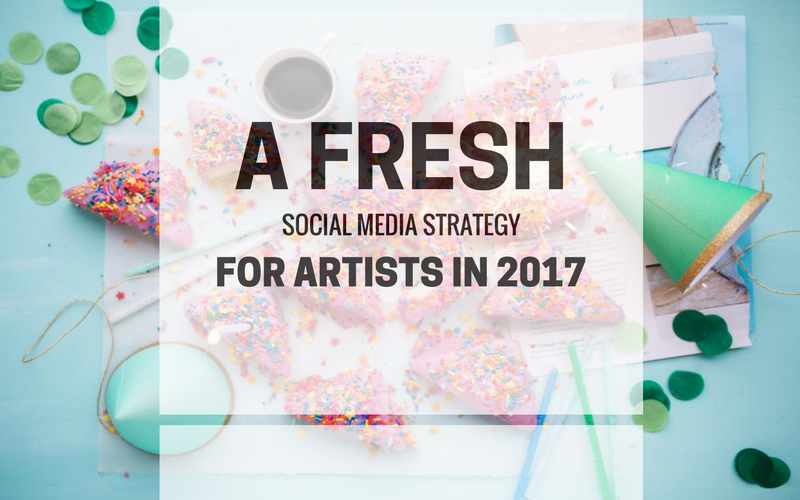 Your final goal for 2017 should be to interact with your fans and other artists on social media. Make an effort to quickly check in on your accounts each day. Reply to everyone who has commented on your posts—a simple “thank you!” might do the trick. Just remember, these people are all potential buyers, and a good interaction with you can go a long way in selling your art. To many artists, social media can feel like trying to fight a ten-legged monster. But it doesn’t have to be a struggle! By following this social media strategy in the upcoming year, you can actually have higher quality posts while spending less time on social media. And you know what that means—more time for creating art and making sales. Looking for more ways to keep your art business organized in 2017? Give Artwork Archive's free 30-day trial a try to see what it can do for your business. Same old ideas not hooking your art customers? Engage your fans with these 7 fresh art marketing ideas.